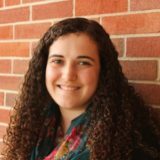 Alexia Gerber joined the Covenant community in the fall of 2017 as a volunteer to our office staff. She is now employed full-time as the Pre-K Aide and the Assistant to the Dean. She graduated from Grove City College, majoring in Economics and minoring in German. Alexia enjoys reading, sewing, knitting, calligraphy, and spending time outside. She and her husband, Kyle, attend Redeemer OPC in Carlisle.